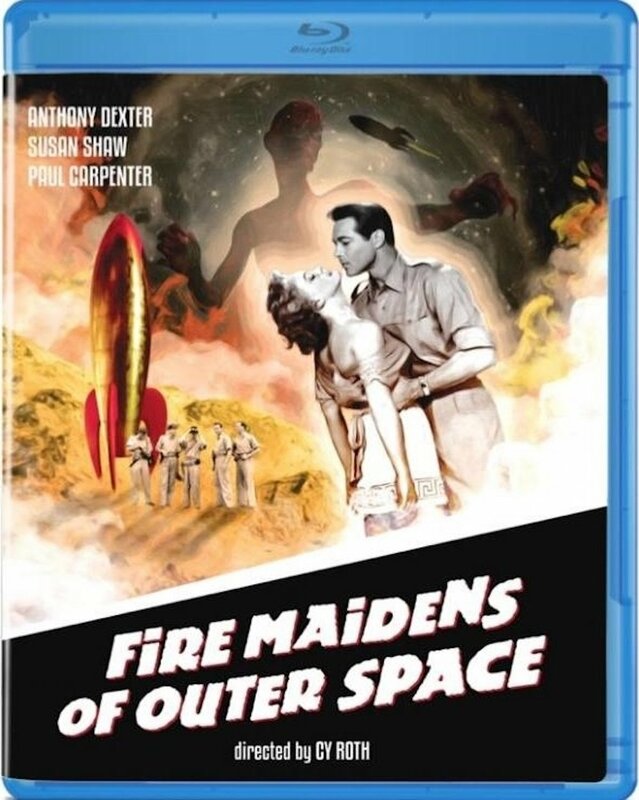 "Fire Maidens of Outer Space" (1956), Blu-ray. Original title, "Fire Maidens From Outer Space". An Olive Films release from 2013. Video on this one is 1080p/24, Black & White, in 1.66:1 Aspect Ratio (meaning there will be narrow Pillar Box Bars on either side of the image). Audio is DTS-HD MA 1.0 48 kHz. This film was shot in Black & White, 35mm, but the presentation here has a grain structure that looks more like 16mm (even worse in the processed "stock shots", of course), and also looks like contrast was pushed in a number of scenes. Presumably this is all due to "generation loss"; although why people would have dup'd this incredible turkey in the first place is beyond me. The natural aspect ratio of the 35mm, spherical lens, filming would have been 1.37:1 -- basically 4:3. However, for Theatrical presentations, that would have been matted down by the projector operator (losing a portion of the image off the top and bottom) to make the film look rather more "wide-screen-ish", instead of the by-then increasingly old-timey 4:3. Wide screens were, of course, a major part of the theater owners' marketing efforts to drag people away from their TVs, and they weren't about to let the fact a film wasn't SHOT like that stand in their way! The question is though, how MUCH was it matted down? And as is common with films of the 50s -- and particularly so for B-grade pictures like this -- there's no agreement on what the filmmakers actually had in mind. Indeed with THIS film, the filmmakers probably hadn't given it much thought, anyway! So Olive Films guessed 1.66:1 for this Blu-ray transfer. Not to worry though: The lasting impressions left by THIS flick are WAY beyond such technicalities! Disclaimer (included in the opening Titles): "All Characters in Space are Fictitious"
Perhaps not surprisingly, it was also Roth's LAST Directorial work. But as bad as it is, it's rather shocking to learn this dreadful story is not even particularly original! Whether intentional or not, it appears to be an EVEN WORSE remake of the already cheesy, "Cat-Women of The Moon" (1953). I.e., Roth stole somebody else's, already released movie idea, and still managed to screw THAT up! Lack of originality didn't stop at the script either. There are evidently NO original effects shots in this film. Not one. Every single effects shot is either lifted from some other sci-fi work -- it was pretty easy in the 50s to acquire "stock shot" rights for cheap -- or, as in the case of the rocket launch, it was just historical footage -- in this case of a V2 missile launch. A pretentious voice-over sets the scene; explaining that the Americans and British, in the interest of world peace, have been working on a secret project: "Project 13", and that the American, Luther Blair (Dexter) is flying to London to take charge of the project. After an establishing shot of a cheap cardboard sign reading, "London Airport", we are treated to perhaps the worst example of dialog recording in the history of sound films, as Blair and a British member of the project reveal, barely-audibly, that Project 13 is a mission into -- wait for it -- *SPACE! * Indeed they are going to travel to the recently discovered, 13th moon of Jupiter (a discovery which didn't actually happen in real life until 1974), because it is so gosh darn Earth-like! They even joke that there might be HUMANS on it. But, nah, that wouldn't be "science", don'tcha know. By this point, observant members of the audience have noticed something. And no, I don't mean the lousy script and incredibly poor production values. No, what starts to intrude on your consciousness is that all of these characters SMOKE LIKE CHIMNEYS! Indeed it seems the only bits of "stage business" ANY of them can come up with on camera have to do with fumbling for cigarette packs, finding a match, lighting up, dealing with the resulting smoke, or mumbling dialog while madly puffing away! Anyway, they launch off into space (stock shot) and have to dodge some asteroids (stock shot) and look out at the vastness of space (stock shot), all while sitting around what looks very much like an office desk, complete with adding machine. As they approach their moon, a mysterious voice on the radio -- from the moon! -- gives them instructions -- in English! -- on where to land. Can you imagine the tension? So it's really no surprise the very first thing they do after landing -- EACH AND EVERY ONE OF THEM -- is light up a nice, relaxing cigarette! So out they trot in their shirt sleeves, and promptly come across a comely young woman: Hestia by name -- a Fire Maiden (Susan Shaw) -- being accosted by a Monster (Richard Walter) who looks very much like a guy in a zip-up, all black jumpsuit, sporting a preposterously constructed, and totally immobile, black monster mask. Our heroes scare off the Monster, and in gratitude Hestia leads them back to where she lives -- with 14 OTHER Fire Maidens and one old man, Prasus by name (Owen Berry). In between cigarette breaks, Prasus explains that his group are the last survivors of the lost civilization of Atlantis! Seems they kind of miscalculated, and figured ALL the land on Earth would end up under water when Atlantis started to sink. So they debarked to this moon of Jupiter and set up housekeeping there, oh, a long time ago. And honestly, it would be pretty much ideal as a new home if it weren't for that damn pest of a Monster (apparently the only other inhabitant). Now don't get any silly ideas, as these Fire Maidens are all prim and proper daughters of Prasus. He knows full well he needs some *OTHER* men to, umm, help rebuild Atlantis to its former glory -- and population count. OK, maybe it IS time for silly ideas! The silly ideas involve some drugged drinks and, well, there's no polite way to put this, CHOREOGRAPHY by the Fire Maidens -- to the tune of Alexander Borodin's music (more popularly known, today as the ditty, "Stranger in Paradise"). Public domain music is SUCH a cost saver, don'tcha know! The drugged drinks are effective -- even putting a stop to their smoking for a while! And before you know it, our heroes are locked away in stylish rooms each featuring -- well -- a bed. They are also sans their guns. But at least they've been left their cigarettes and matches! Fire Maidens appear through secret panels and bedevil our poor lads with suggestions like "You are our guests," and "Wouldn't you like to get comfortable", and other such bland innuendo -- all while remaining scrupulously within the bounds set by the Production Code. Things are definitely looking, umm, awkward for our heroes ("I'm a happily married man! "), but Hestia (you remember her, rescued from the Monster?) has taken a shine to Blair, who apparently now owns her because he saved her life. Anyway, Hestia explains that Prasus is just an old meanie, and she'll help them escape. Things get pretty confusing about this point, but the end result is that our boys DO get to rocket back to Earth -- taking Hestia with them -- and promising to send more men back to help out all the OTHER Fire Maidens. Hint. Hint. Wink. Wink. PQ and AQ on this Olive Films Blu-ray, are serviceable, "bad DVD" quality for the most part. See the notes in the sidebar above for more. (Indeed, if all you can lay your hands on is the SD-DVD of this flick, you are likely not missing much.) I've not had much luck with other, Olive Films transfers I've viewed, but I could readily believe all the problems on THIS disc are inherent in the original filmmaking, and, of course, in the available source elements Olive had to work with. But really, it makes not a whit of difference. The stuff you want to watch in this film is in no way compromised by less than pristine presentation!